why would hardly nords hire women to fight and defend there citys? what are you some kind of milk drinker? You're not compelled to install this mod, you know. You have agency. You can choose to not click that download button. In fact, in your case, I think I positively encourage you to not click it, for your own peace of mind. Speaking of agency, that's one of the reasons I wrote this mod. I want my game to better reflect the agency I'd like to see people have in the real world. I do what I can to help improve things in the real world, and one of the ways I do that is by trying to be an example of someone who lives in the world I'd like to see. This mod is a teeny tiny example of that, making the game world a tiny bit more like a place I'd like to live in. If the existence of this mod offends you, if you are filled with horror at the very thought that there may be people playing a game that does not conform to how you think things should be, well, there isn't much I can do about that. Except maybe take some small satisfaction from making the world of someone whose views I despise a less happy place for them (I claim to be a good person, mostly, not a nice person). Whatever, your misogynistic prescriptivist fundament is not welcome on my mod page. Begone. I will delete your post, likely report it at the same time, and probably block you from my mods. In short, get thee into the nearest large body of salt water. PS: I love drinking milk, it is very tasty. PPS: If you don't know what agency means in this context, you have an entire internet at your disposal. Go and enlighten yourself. PPPS: Don't whine about lore-appropriateness either. You clearly weren't paying attention when you started the game. I've just uploaded Version 5.2. It's a minor update, just carrying through some USSEP changes that have happened over the intervening year (it is not dependent on USSEP, though). The More Nords patch does not need changing, so remains at version 5.1. This mod roughly doubles the number of guard and soldier faces you could get to see, so hopefully that should make it a little more diverse. I'm not sure if this is a bug or if it's just my eyes playing tricks on me. Using MO2, I loaded the game up with only two mods installed: Open Face Guard Helmets (so I can see their faces) and this one. Sometimes, it seems a guard will spawn with a Redguard's face but a white body. (You can see this by looking at the arms of the sleeveless guards.) I've seen Redguard guards spawn with Redguard bodies (and using GetIsRace in the console confirms they are Redguards). 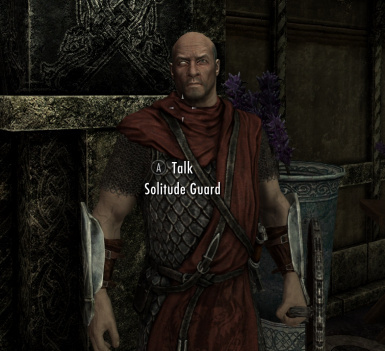 For the mismatched guards, GetIsRace reports they are Imperials. To further complicate this, I tried "removeallitems" in the console on the mismatched guard. When he was standing in his underwear, his face didn't look QUITE so dark. Just sort of, darker, then the rest of his body. I don't know if the helmet added shadows to make it look darker, or if his face colour actually changed when the helmet was removed. 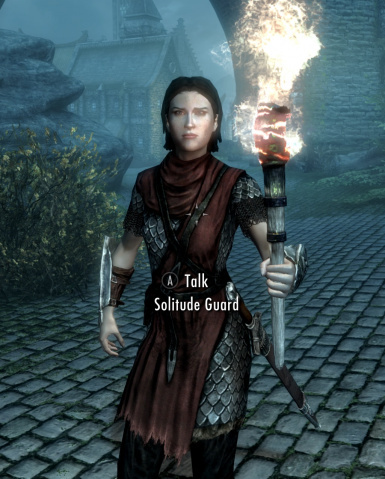 I realize the guards probably spawn randomly, but I always seem to get a mismatched guard just outside the gates of Whiterun. This looks like what is known as s the "Black Face" bug. What's happening is that for some reason the game isn't picking up the facegen assets, which are in the mod's .BSA archive. I don't use MO2, so I can't help you specifically there, but I think the problem will be related to how you've installed it. I thought of this, so I "forced" a black face bug so I could see what it was like. This was not it, the face was not dark enough for the black face bug. It's probably just a weird lighting effect on my end, or like I said, my eyes playing tricks on me. I haven't seen anyone else mention this, and I only had the two mods installed, so I can't see it being a conflict. Is there any way to increase Imperial guards in the Empire's territories? Male or female in even amounts sounds accurate. Incidentally, is it possible to add more Breton guards to Markat? P.S. : Risky thing to add, but thank you for not making this into sjw propaganda. I really appreciate the impartiality and dedication to canon and lore. I still think this is the case. If a Jarl of a hold was non-Nord, then maybe I could see it happening in that hold - but that's not the case. Yes, particular areas may have different ethnic mixes but Skyrim is still predominantly Nord. It just feels to me like it would be out of place. 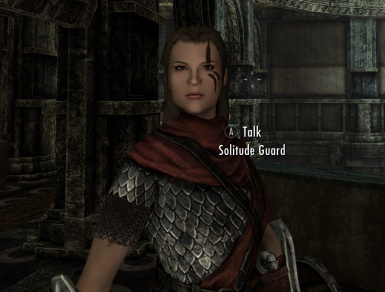 There is also the small matter that the only voice types that support Guard dialogue are ones commonly used for Nords - there is only one female variant, for example, and she has a distinct accent. I've accepted that these voices sound wrong for the male and female Orc Imperial soldiers I've added, but I don't want to make it any worse. I'm having the issue whereby all the female guards have Stormcloak armour, I use CBBE and Stormcloak Revival (http://www.nexusmods.com/skyrim/mods/70723/?) the only other mod I can think of that would cause trouble is Rearmament of Skyrim ( http://www.nexusmods.com/skyrim/mods/49681/? ). However despite disabling all three mods and waiting 24 in game hours and resting the guards via console the issue persists. This is the same problem that PhantomJedi759 is suffering from immediately below. The models used for female Stormcloak armour have to be constructed in a specific way if the game is to be able to apply different textures to the models so they they look different in different holds. In the vanilla game they are constructed properly, but many of the replacer models out there used for different body replacers aren't constructed properly (because those who made them didn't realise they needed to be), so the game can't apply the different hold textures properly, with the result that all of the female guards (even the vanilla ones in The Pale, Winterhold and The Rift) appear to be wearing generic Stormcloak armour. This is fixable by a plugin, but what goes into that plugin does depend on the replacer themselves. A proper fix is for the original author to update those models. Also, the link you gave to Rearmament of Skyrim is to a mod for Original Skyrim, not Skyrim SE. It should not be used with SE. It may appear to be working, but in fact you are risking subtle errors in your game. First off, great work on this mod. Just feels much more immersive now. So I've also run into the problem of having all female guards dressed in Stormcloak armour. I am using replacement textures and UNP. You mentioned that this issue is fixable by a plugin. What would need to be done? Thank you! I keep meaning to try to get some sort of tutorial together, but my time keeps filling up with other things. Sorry. I'll get to this at some point. I don't mind doing the work if you can pass along some info on what we need to change. I'm alright with NIFscope and CK so I just need to know where to poke around. EDIT: wait I just noticed these comments were from 2017 lol. Dead mod? Oh well. No, the mod is still alive, it just's finished in terms of what I want it to do. Also, you may not necessarily have problems body and clothing replacers, some are done correctly. It's just that people who *do* have problems with all guard outfits looking like stormcloaks, that's the reason why. So does anyone know if the UUNP body works without issues with this? It should work absolutely fine - the mod itself is body-mod agnostic, it will depend on what clothing replacers you use with your body mod. I suggest you just try it and see. Hi, can the mod author share how, in general, this mod was created? I'm interested in doing something similar. I know that this add more females to the guard but does it also add more females to the Legion? I asked because I'm pretty sure vanilla has ZERO female legion soldier except for some unique NPCs which is ridiculous. Also, what is the gender ratio among the guards? Are there more males than females or equal? It does indeed add females to the Imperial Legion, although the voice types may not match the races. With this mod about 1/3rd of the guards should be female, on average. I'd love to see this mod merged with the 'Various guard outfits for Every city' mod. any idea it it is compatibile? I've just had a quick look. They should be compatible and work together without needing a patch. Love the mod, thanks for making it! This mod looks good. I'm all in for using it. 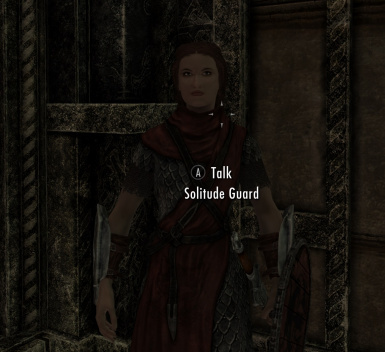 Just a request, would it be possible in an optional file or future option to have the option to have only female guards? If not, thanks anyway for you work here.